Today's newspaper says that the state animal husbandry department has taken up a pilot project for production of organic milk in 3 taluks of Karnataka. When it reaches the market, it will probably sell at INR 30 to 35 a litre, as against INR 22 a litre of regular milk. This product is likely to be picked up by the health-conscious and environ-conscious population in Bangalore and other places. The above news made me search for organic milk availability in our city, and I found none. For that matter the internet gave me only 2 places in Chennai that make organic milk and did not give any other major city in India that sells such milk. 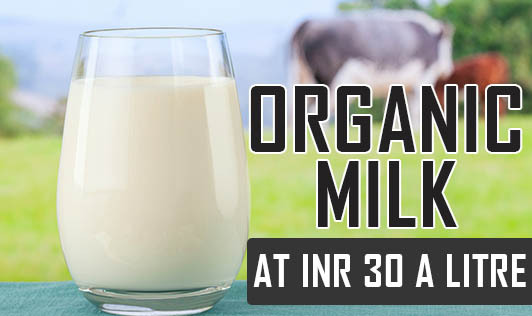 If you're wondering what's special about organic milk, this milk is obtained from cows that are given only organic feeds. Also these cows are neither injected with hormones nor given antibiotics to treat sickness. Organic milk is fairly popular in western countries. Opinions regarding human health benefits of consuming organic milk versus regular milk are divided. While some groups say that organic milk is nutritionally better, some say that there's no difference in the nutrition aspect. However, there's no debate on eco-friendliness of organic milk. Taste is subjective and might vary for every individual. Choice of whether you wish to buy organic milk or not, is entirely yours. If you do, let us know your thoughts. Also if you know the availability of organic milk in your city, do write to us.